Logistics & Supply Chain Awareness Archives | Page 5 of 15 | Morai Logistics Inc.
With the increase of transportation management systems, tighter driver availability, and growing regulatory guidelines, it is essential to collaborate with carriers to ensure you are adding profitable business to their network. This will solidify a long-term relationship that will save you from costly changeovers. Here are 5 signs to look out for that maybe it’s that time. 1. The Last Time Your Carrier’s Technology was Updated, iPhones Didn’t Exist. In order to stay competitive, it is key that your carrier embraces technological changes. Implementing the latest technology helps to continuously gather intelligence regarding your market and assists in mitigating risks. Even embracing technology as simple as RFID can help improve supply chain visibility from start to finish. It is essential that carriers are capable of evolving as consumer demands evolve, allowing companies to take advantage of potential in new markets and quicker react to opportunities with current consumers. Competitive rates are a no brainer. In order to build a strong relationship with clients, carriers must offer competitive rates. This gives the ability to negotiate and strategize the best possible options and plans based on your needs. Rate shopping can be a daunting task, and your carrier should be able to provide rate costs that best fit your budget and shipping requirements. By providing competitive rates, your carrier is acknowledging that they want to give you the best benefits at the best prices. If your carrier refuses to budge on your rates, it’s definitely time to find a carrier that has your best interests in mind. 3. Instead of PB & J You’re More Like Pickles and Marshmallows. The relationship between carriers and clients is important. Your business needs are important, and you should be a priority to your carrier. Long term relationships can often result in better plans and rates based customized to your specific shipping needs, and can help when evaluating bottom line. A positive carrier/client relationship can often offer discounted rates over the course of time, in addition to more carrier options and credibility to your business which can minimize risks of shipping nationally/internationally. Everybody makes mistakes, and everybody has those days. While service issues are a reality, recurring service issues should not be. Frequently experiencing issues and service problems is not necessary and is costly to your business. When you find yourself constantly addressing service failures that your carrier refuses to acknowledge with no signs of improvement, it’s time to find a provider that takes places importance on the level of customer service they provide. The nature of business relationships are not always win-win. The ability of both parties to give-and-take to serve customer needs is more important for a lasting business alliance. However, sometimes a partner may take too much either through limited capability or limited ability. 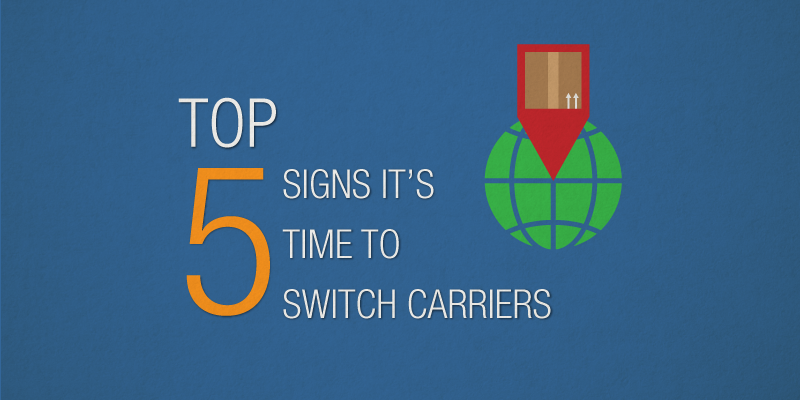 Depending on where your business is at present, and where it needs to be, it may just be time to switch carriers. Transparency within the supply chain used to be quite the grey area. With consumers more interested than ever in knowing exactly where their products come from, the need for supply chain transparency is vital. Consumers today demand to know the origins of the products they are purchasing. Knowing a product has been ethically sourced or produced in a sustainable manner increases value, and creates loyalty and trust between consumers and companies. 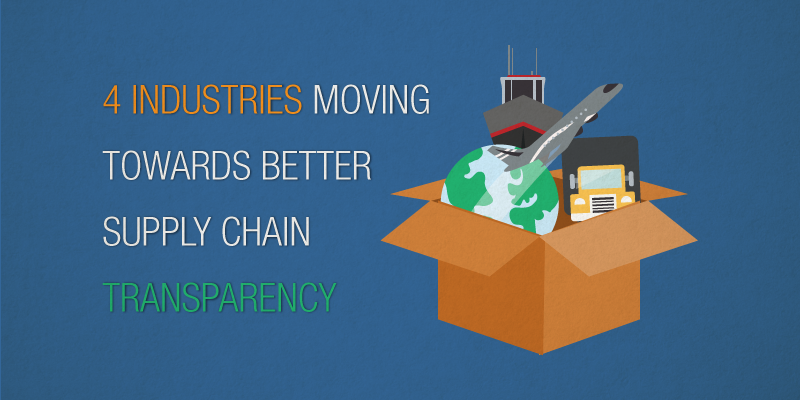 While it may seem like creating total supply chain transparency would be a no brainer, many businesses worldwide still turn a blind eye and fail to place importance in this necessity. Scandals continue to arise each year as company after company is faced with the consequences of hiding how their goods are produced. According to The Toronto Star, more than 40 Canadian drug companies have been cited for serious manufacturing violations, putting patients at risk by selling prescription drugs that companies sold with knowledge that they were defective. In this case, not only were companies hiding test data about the production of their goods, but they were additionally putting consumers at risk. In February of this year, Bloomberg News reported finding many popular Parmesan cheese brand manufacturers were using wood pulp and cellulose as cheap fillers in their products. While the FDA in the USA regulates that companies can legally use cellulose as a filler, consumers were outraged at the lack of supply chain transparency in the manufacturing of this product. Cotton Industry – Although the apparel production still has a long way to come in terms of total supply chain transparency (with a specific regard to manufacturing), this industry is working harder to be completely transparent with consumers and the exact methods of production for the products they are purchasing. Floral Industry – Companies in this industry are beginning to take charge and are pushing for more transparency. With a large reputation for permitting unsafe working conditions, companies are now providing information to consumers about how they are creating ethical farming practices to ensure the well being of their farmers. Organic Foods – The food industry has major strides to make in terms of transparency, however the farm to table movement has helped in leap starting that transition. Informing consumers about more local products gives them a connection to those producing their food. With clearer supply chain transparency, farmers are receiving better fair wages and safe working conditions, while consumers benefit from ethically sourced and fresher products. Technology – While this industry has faced major backlash for using unregistered workers, unfair wages and poor working conditions, many startups and technology companies are utilizing tools that allow complete transparency with consumers. These tools offer product traceability so consumers can determine exactly where and how a product was manufactured, and if it was produced in an ethical manner. 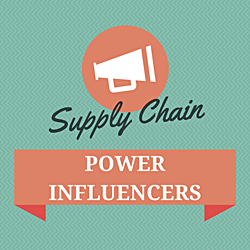 Although there are major adjustments that need to be made in numerous industries worldwide, more companies are beginning to understand the importance of supply chain transparency and are developing methods to better inform consumers. Better supply chain transparency increases value for businesses, and in return increases consumer loyalty and overall brand strength. 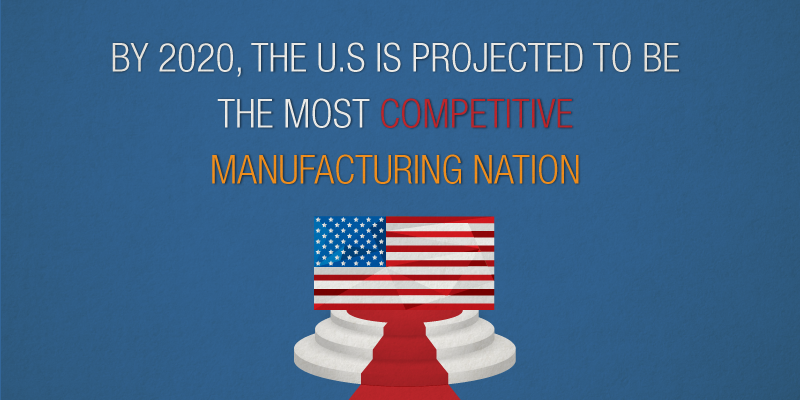 Not only can a lack of transparency be damaging to business, it can also put consumers at risk. Cargo theft isn’t anything new. From the days of bandits attacking caravans to pirates on the sea, if there is money to be made from stealing cargo and fencing it then attempts will be made to steal it. The real change is in the sophistication and planning that thieves utilize in their planning. Globalization has also made the scope of the problem much larger. The ripples felt in one part of the world from stolen cargo can affect consumers and businesses on another side of the world. That’s to say nothing of the highly organized, highly structured, gangs, cartels, and black markets which fence the items taken from stolen cargo whose networks can stretch time zones. 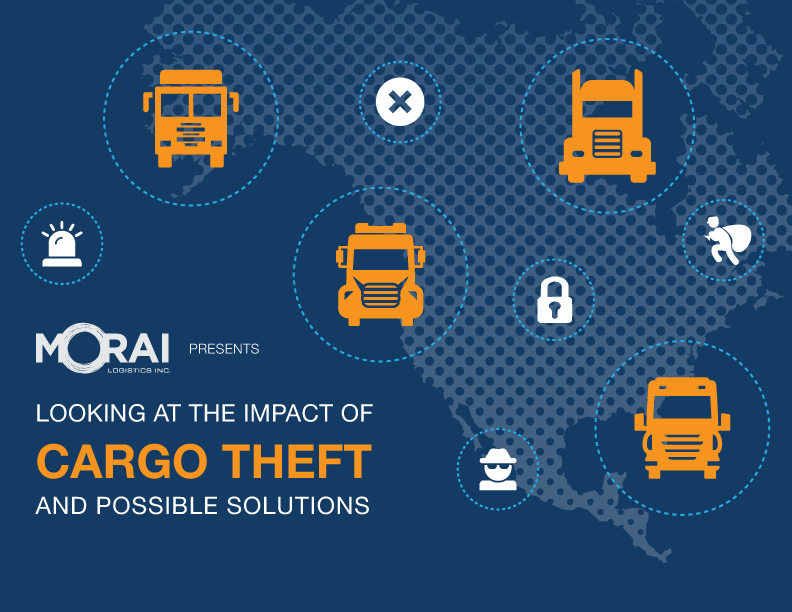 This month, we’d like to focus our ebook on looking at the current state of cargo thefts and ways we can minimize these occurrences. 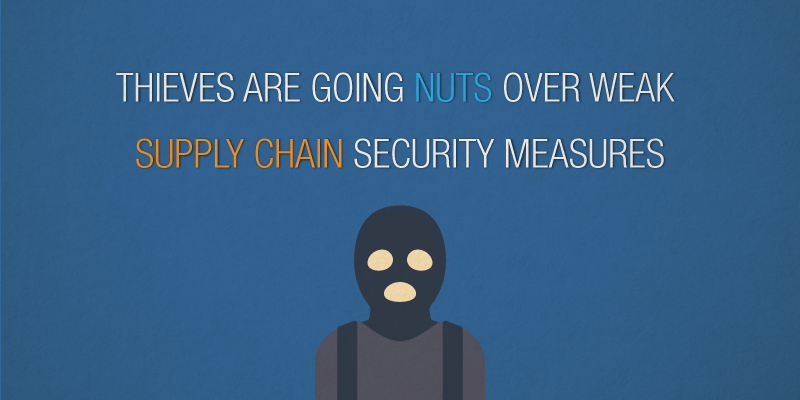 “In addition to the actual threats, many factors make global supply chains complex and challenging to secure. The speed at which today’s supply chains operate, for example, can be difficult to reconcile with security measures” writes Amy Roach Partridge in this 2012 InboundLogistics.com article on supply chain security. “And, because supply chains today are often so long and fragmented, it can also be difficult to ensure security is treated with the same urgency by every party in the process” she writes. This is an important lesson as just earlier this week, several news outlets reported on the California nut shipment thefts that have so far totaled losses of $4.6 million as of just last year. 31 cases have been reported within a span of one year with the thefts costing from $150,000 to $500,000 per shipment. Losses for all four years combined reached nearly $7.6 million. The thieves have been getting high-tech with how they’re stealing shipments as most of shipments were stolen through fraud rather than break in. Websites where truckers search for cargo assignments have been getting hacked as their cybersecurity measures have been lagging behind other industries according to this LA Time article. “A common ruse is to use a false company to hire a legitimate trucker, then tell the trucker to divert the load to another warehouse, where he is paid and sent on his way” writes the article. “Scammers also have used “ghost trucks” that duplicate legitimate ones but are untraceable on trucking databases. Thieves have also tested security measures by sending scout trucks that abruptly leave processing plants without picking up loads” it continues. It may seem strange that these thieves are putting so much effort and time into stealing nuts, but it is important to remember that demand for the health-food snack has soared in emerging economies such as China. California is also an especially lucrative state to target for these heists as it produces more almonds, walnuts and pistachios than any other state, with a combined value of $9.3 billion in 2014. Almonds alone were valued at $5.9 billion, according to the U.S. Department of Agriculture. So why nuts? This article on Quartz.com describes the reasoning, “Food and beverages have replaced electronics as the most-stolen good in the US. Criminals are concentrating their efforts on fewer heists of larger value, and as stolen goods go, nuts have a lot of appeal. They’re expensive. They have a long shelf life. They have no serial numbers and can’t be electronically tagged or traced.” Cargo theft of consumables isn’t all that uncommon the U.S in fact. Just last year about 28% of the 881 incidents of cargo theft involved food and beverages, more than double the number targeting electronics. Of that number, California accounted for 158 of the U.S’s cargo thefts, with losses of about $18.7 million. 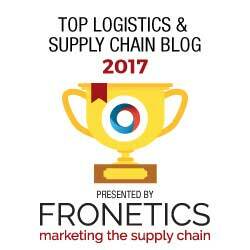 Two new studies were published earlier this month that looked at supply chain visibility and collaboration. The first study by ARC Advisory group titled Supply Chain Visibility & Collaboration Study surveyed 200 organizations from a wide range of industries. The researchers defined supply chain collaboration as “having a collaborative, multi-supplier, multi-tier, supply chain planning solution” writes Steve Banker in this Forbes article covering the study. “For visibility, the definition was a solution providing visibility to the order process (order placed, order adjusted, order accepted), inventory at rest or inventory in motion events, or supply chain risks, or providing a stand-alone supply chain analytics/event management solution not embedded in other solutions” he continues. Why have B2B network suppliers emerged as leaders in this market? How will Internet of Things data be leveraged by these solutions? 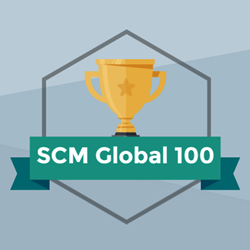 How will these solutions affect the next generation of supply chain software platforms? 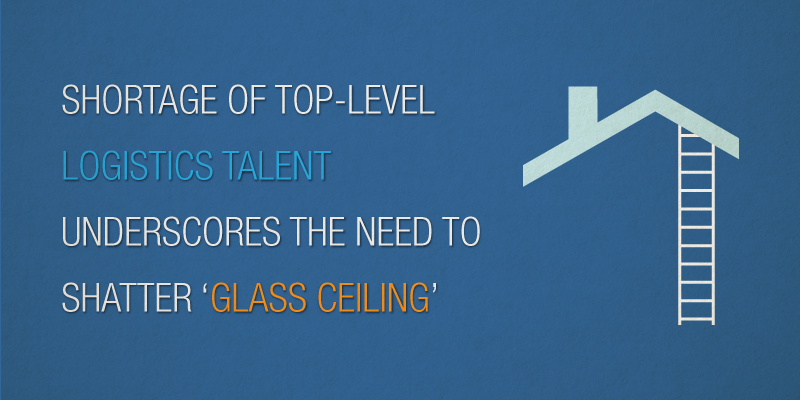 What are the niche solutions poised to grow rapidly in this market place? 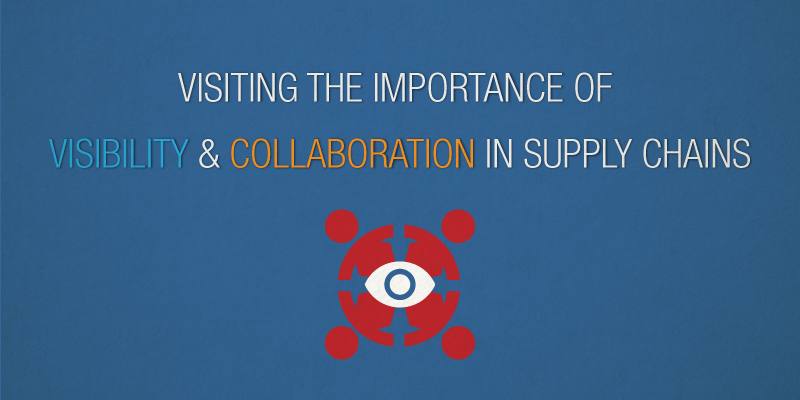 What the survey finds is that not only visibility and collaboration software is growing very rapidly, but that B2B network solutions specifically (for both visibility and collaboration) is what’s driving the market’s rapid growth. The ROI with visibility projects has to do with SCP applications improving service levels with less inventory. “The more companies can reduce their lead times, and the less variability there is surrounding those lead times, the better the ROI that can be achieved with SCP tools. Supply Chain Visibility, provides the data and metrics surrounding lead-times, and then allows Lean practitioners to work with supply chain partners to improve and control those lead-times” writes Banker. Another reason why visibility is so important is supply chain orchestration. Through orchestration, a company is able to balance supply-demand in reaction to surges as well as deal with supply disruptions more promptly. The second study published by the University of Tennessee’s Global Supply Institute, in collaboration with B2B integration provider DiCentral. The study involved surveying over 200 organizations of various sizes and asking respondents to weigh in on issues such as inventory visibility, supply chain costs, new enterprise resource planning integration, and responsiveness to customer demands. The study found that to increase business flow efficiency and cut cost, many companies are investing in B2Bi (business to business electronic integration). “Of those surveyed, 94 percent saw significant improvement in their electronic connectivity capabilities and 68 percent reported that their clients said they were easier to do business with after using cloud-based B2Bi managed services” write the researchers. Almost anything can be purchased online. Items such as books, movies, clothing, cameras and groceries are just a few clicks away from consumers. With services such as one hour delivery or similar offered by Amazon and other companies, customers can be sure that they won’t have to wait long before receiving their items. Best part of all, because the items usually come straight from the manufacturer, the prices are usually competitive. But did you know that chocolate, a relatively common treat enjoyed by so many, presents a big logistics problem for companies that are trying to offer individual deliveries? The issue has to do with heat. During the summer months and in warmer climes, chocolate will melt or “bloom” which is when fat in the chocolate rises to the top and leaves a white discoloration. It is for this reason that refrigeration is so important when shipping large shipments of chocolate across long distances. However, the economy of scale that offsets the costs of refrigeration goes away as shipments become smaller. So although the holidays are a popular time to give chocolates as gifts, chocolate makers are not typically making the profits that those outside their business would expect from the surge of orders seen around Valentine’s Day, Christmas and Easter. 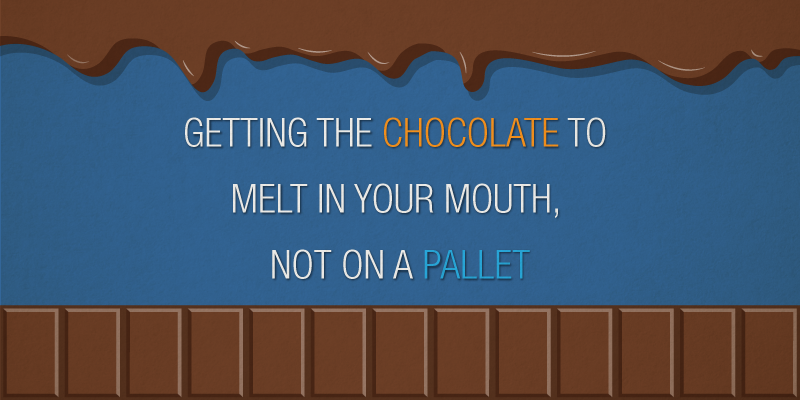 Keeping a small shipment of chocolate cool can cost more than the product itself. Hershey charges $6.95 to ship a $4.25 bag of Kisses ordered on its website. In a notice on the site, the Pennsylvania-based maker of Kit Kat and Reese’s also “strongly suggests” that customers buy liquid ice packs and a foam cooler for an additional $4.99. That, plus the recommended expedited shipping, would bring the cost to $20.20, before taxes. As sales for chocolate grows, the volume of individual orders and sales will continue going up. For example, between 2010 to 2015 overall online chocolate sales grew over 80% in the U.S. Chocolate is also seeing a rise in sales internationally as countries such as China are consuming chocolate and growing rates. Europe is also seeing a surge in chocolate sales with the UK as its export of chocolate to Switzerland has increased 160% in just the last four years. The UK has become a major exporter of chocolate both within Europe and for emerging economies. “Overall, U.S. online chocolate sales rose more than 80% between 2010 and 2015, to $341.7 million annually, according to data provider Euromonitor International, and e-commerce represented 1.9% of all chocolate sales last year, up from 1.2% five years earlier” writes Whelan. There are attempts at bringing down the costs of online shipments. Last month, Hershey accepted its final entries in a competition with a prize of $25,000 for whoever designs the lightest, most-affordable packaging to keep chocolate from melting for at least 48 hours. It hasn’t announced the results.